Dewy makeup is not everyone’s cup of tea, especially not for those with an extremely oily skin type! 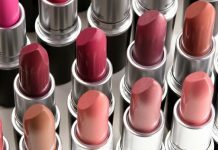 The invention of matte formula in makeup products has saved a lot of us from looking like an oily sweat ball while we have makeup on our skin. That being said, I recently got to know about a new makeup collection launch which is going to excite all the matte-makeup lovers. 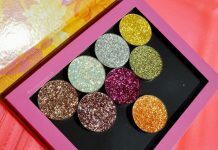 And the collection I am talking about is from the world renowned drugstore brand known for their highly affordable pro-quality products – Makeup Revolution! The new Makeup Revolution London Meet Your Matte Made In Heaven is a collection of matte base products that have been launched by the brand after numerous demands from the makeupholics. This collection includes foundation, concealer, pressed powder and a couple of more exciting things – all with an oil-free, matte formula. So keep on scrolling to know everything about the exciting new Revolution Matte Base collection and check out its reviews. This foundation offers a mattifying solution for oily, blemish-prone complexions – or for those who simply prefer a matte finish. Launching in 24 skin-true shades and a range of undertones, this full-coverage foundation boasts a long-wearing, matte finish that still manages to feel lightweight and comfortable on skin, whilst diffusing the appearances of pores for a blurred, airbrush-like finish. Designed in a sleek, travel-friendly tube with pin-worthy rose gold accents. 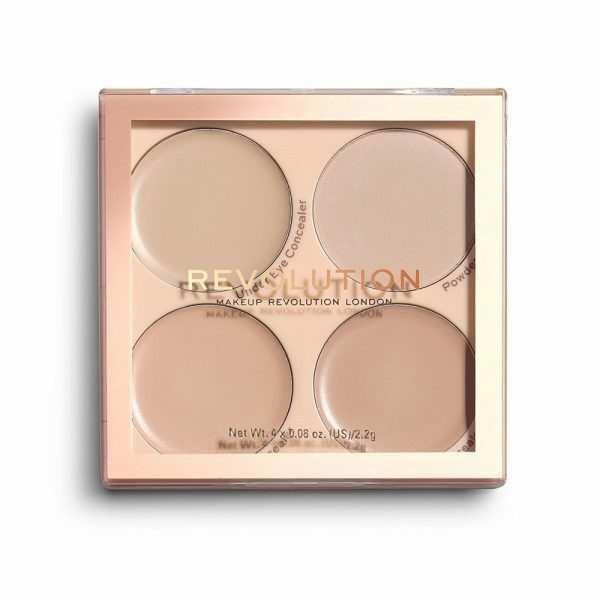 Despite being a drugstore brand, Makeup Revolution always makes sure that there is a shade of foundation/concealer for each and every skintone in their collection! This is a basic consideration that a lot of brands lack these days. 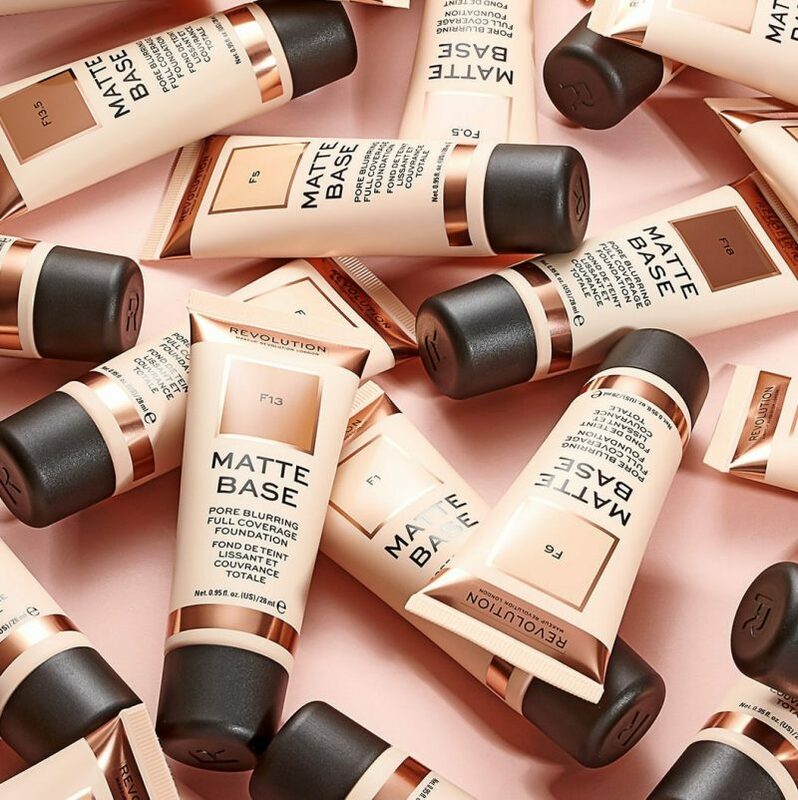 In the all new matte makeup base range too, they have included 24 shades of matte foundations ranging from lightest possible ivory shade to the deepest ones with three different undertones (warm, neutral, red). The foundations are vegan, cruelty-free and of course, oil free! You can check out the Makeup Revolution Matte Base Foundation swatches and wear test in the video below. 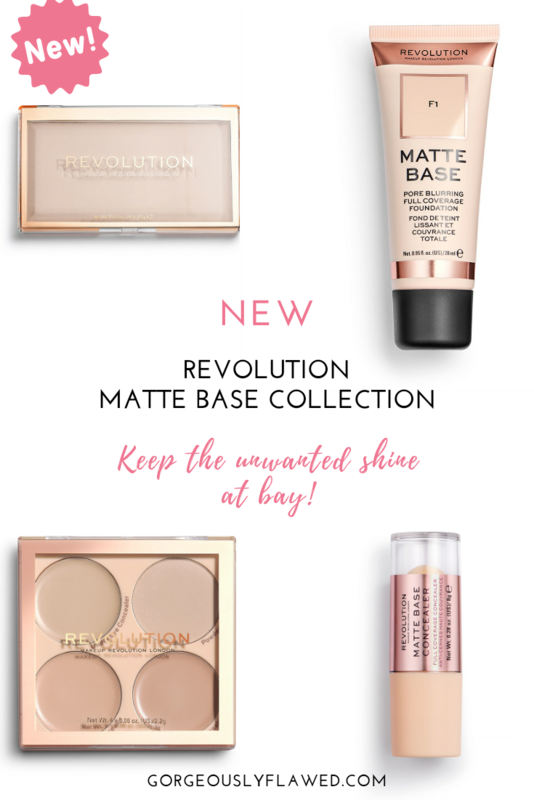 The Makeup Revolution Matte Base collection is only available on Revolution Beauty’s website as of now. It might get launched in offline drugstores super soon. 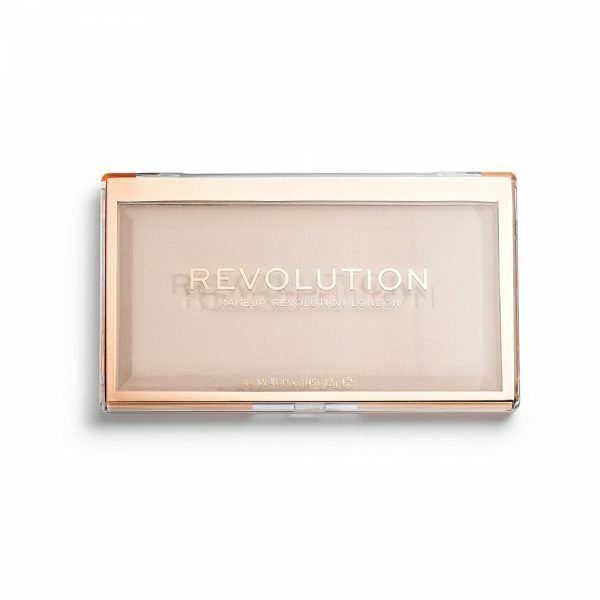 But if you want to get your hands on it right away, you can place your order on Revolution Beauty. Right now, they are running an offer with which, you can get Free Shipping on Orders over $60! The perfect partner for Matte Base Foundation. Launching in 18 shades in a range of undertones, this weightless, silky-soft powder blends effortlessly into the skin for a natural finish that will help to keep midday shine at bay. A matte face powder not only elongates your foundation’s staying power by setting it in place, but it also keeps the annoying shiny/oily look on the face away for hours to come. And the most surprising part is, the brand has launched Matte Base Powders in 18 shades which is quite unusual (but worth the appreciation!). 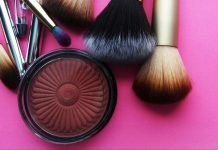 So if you have always had a trouble finding the perfect shade of pressed powder according to your skintone, this new range would end your hunt! The only downside is, these powders don’t come with a mirror or a puff, so they are clearly not ideal for your travel makeup bag to do quick touch-ups. 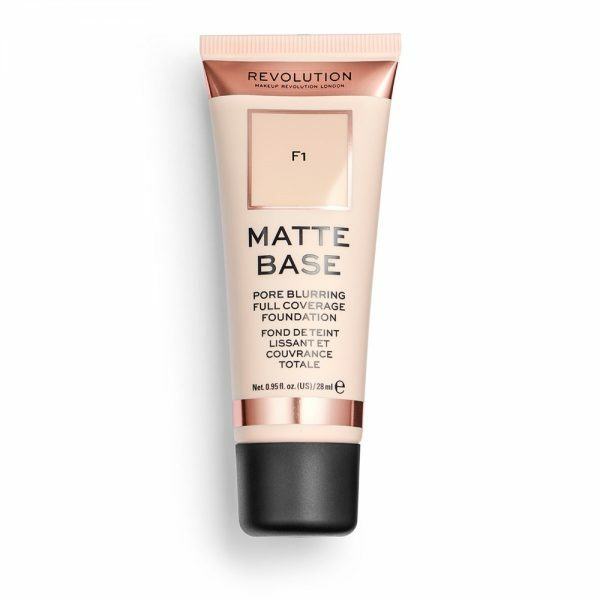 Cover blemishes, uneven skin tone and counteract dark circles, with Revolution Matte Base Concealer. A smooth and creamy texture, that dries down to a comfortable matte finish. Designed with a team matte mantra in mind – because not everyone can do dewy! The brand’s Revolution Conceal & Define range of concealers are winning the hearts (and awards!) of makeup lovers around the world ever since they were launched. 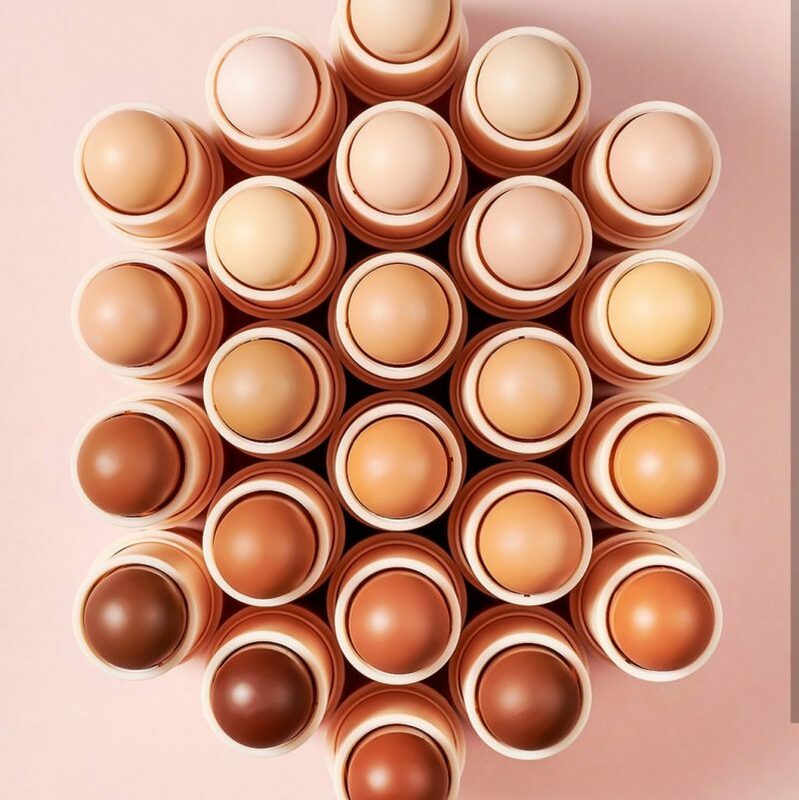 They recently surprised the fans of this concealer range by increasing the shade options to 50. 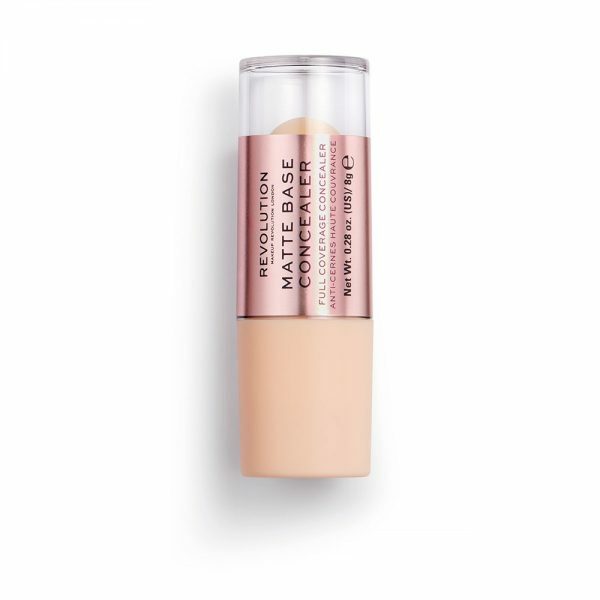 If you happen to be a fan of their Conceal & Define concealer, then you may also want to check out the new Matte Base Concealer range which is in a twist-up stick form. Stick concealers are the best for those with an oily to combination skin type as they stay put throughout the day, without creasing or budging! You can also pick-up contouring and highlighting shades from this collection, all thanks to the variety of shades available in it. For some people, finding the right shade of concealer for themselves is next to impossible! 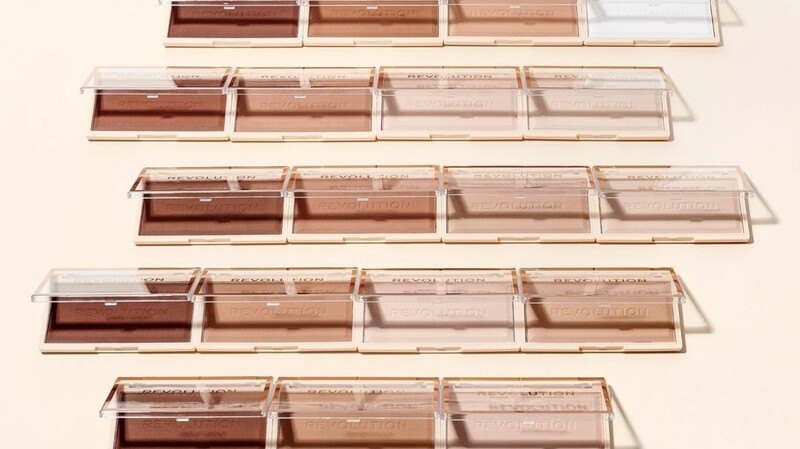 In such cases, concealer palettes come in really handy since you get multiple shade options and also, you can mix up two or more shades from the palette to create your own shade! Revolution Beauty has launched 4 concealer kits in the matte base range and each concealer palette has 3 shades of concealers (same shades as the ones in stick form) and 1 powder for setting the concealer. The palettes are labelled as per the shades they have; Palette #1 – C1-C4, Palette #2 – C5-C8, Palette #3 – C9-C12, and lastly, Palette #4 – C13-C16. 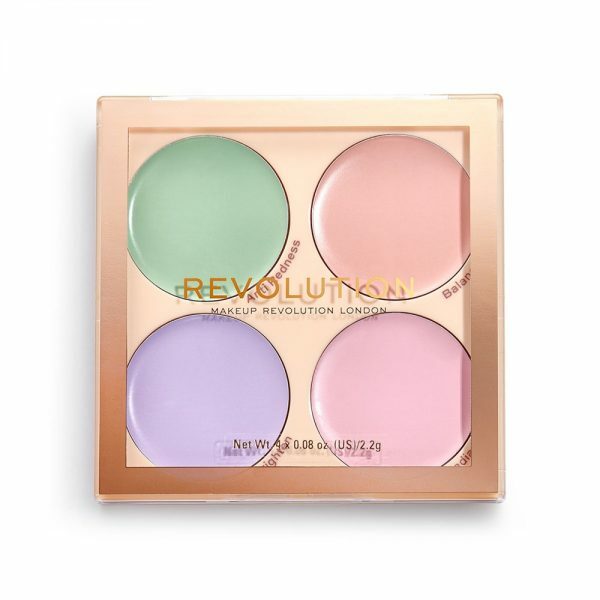 Revolution Matte Base Corrector Kit is a travel-friendly palette featuring four pans of colour correcting cream.The smooth texture that dries down to a matte finish, ideal for skin types prone to oiliness and unwanted shine. This palette includes pastel shades in mint green, peach, lilac and pale pink to balance discolouration. For best results, apply sparingly to areas that need it the most and follow with your favourite concealer or foundation. Green neutralises redness from rosacea, flushing or breakouts. Lilac brightens dull complexions to create a healthy appearance. Peach helps to neutralise under-eye circles on darker skin tones before applying concealer. Pale pink cancels out dark shadows around the mouth and combats dark circles under the eyes. A drugstore corrector palette is an ultimate product for a makeup beginner with a problematic skin! Because, well, if your skin’s condition is anywhere close to mine is, a concealer alone wouldn’t be enough to cover your blemishes and dark circles. They need to be colour corrected first, before you go ahead and put on your foundation or concealer. The new Revolution Matte Base Corrector Kit makes a very affordable option if you are planning to buy a colour correcting product. It is available in a single shade option (usually there is a separate one for deeper skintones), but the shades in it seem quite universal. It is impossible to get a quality colour correcting palette with all 4 essential shades at a drugstore price. These were all the products in the Revolution Matte Base Makeup Collection. I would surely update the list whenever there will be a new launch in this collection. Let me know which product are you going to pick from this range! And while shopping on revolution beauty, don’t forget to grab the free shipping offer!